Home » Random » There’s no crying in cycling! Okay, I’m no crybaby, but this is the second time that a bicycle ride through Washington, DC has left me in tears. It was nothing, really. A car sped past me through a light (even though he was in a right turn lane) and nearly edged me into oncoming traffic in his hurry to squeeze into my lane. Maybe that sounds like a big deal to those of you who live in other parts of the country, but for those of us who cycle in DC, it is–sadly–an everyday occurrence. I guess the part that really got to me was when I glanced over at the driver. He was glaring at me, as if I had violated his god-given right to change lanes at will. He wasn’t thinking about my safety–or his, for that matter–and he certainly wasn’t thinking about traffic laws. Not prepared to get into a fight with several tons of metal, I slowed down. He crossed into my lane and sped away without even looking back. But there’s no use crying over unenforced traffic laws. I’ve been contemplating this post for several months now, and now I think it’s time to write it. Although overall roadway fatalities have declined to their lowest level since 1950, the number of pedestrian-car fatalities has inched down stubbornly. Nationally, the fatality count dropped last year by 322, to 4,092. In the Washington region, it declined by one to 85. Pedestrian dies in morning accident in D.C.
D.C. Police are investigating a fatal pedestrian accident in Southeast Washington. The pedestrian was struck around 10:30 am at First and M Streets SE, according to authorities. Emergency workers arriving on the scene found that the person had died, according to D.C. Fire/EMS officials. No further details were immediately available. Now that I’ve served up these very sobering statistics and articles,1 how about a side of anecdotal evidence? 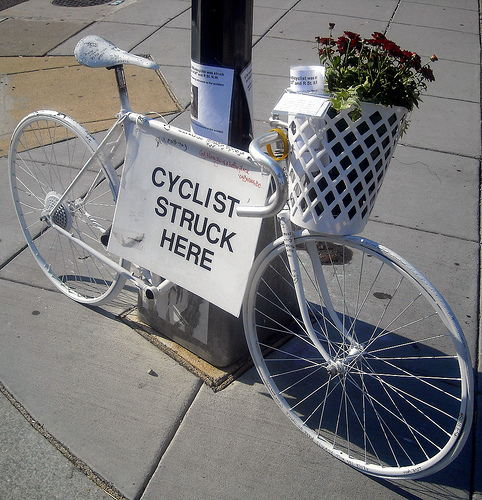 I don’t know anyone who cycles in DC and hasn’t been involved in an accident with a car at least once. I’ve had drivers speed past me with only a foot or two of space between us, leaning on their horns the whole time. Others have run stop signs or tailgated me for blocks, honking and flashing their lights. Just a few weeks ago, a colleague of mine was struck by a car while crossing an intersection. She had a green light. She (or rather, the car that hit her) broke several ribs, fractured her arm, and injured her hip. There were many other major and minor injuries. She doesn’t have feeling in one of her hands. In addition to the cast, sling, brace, and special orthopedic shoes, she’s still waiting to find out if she needs to have surgery. But if she hadn’t been wearing her helmet, she probably would have died. Her bike is gone, her helmet is cracked, and the only souvenir she has from her accident is the traffic violation ticket a policeman thoughtfully left with her on the stretcher. This is not an uncommon story. I’m a very cautious, almost paranoid cyclist, but can’t shake the feeling that it could be my any day now.2 In most places, it’s enough to wear a helmet and reflectors, turn on rear and front flashing lights, signal at turns, stop at signs, and use designated bicycle lanes.3 In Washington, DC it’s not enough. All this is not to say that bicyclists and pedestrians are without fault.4 Many cyclists run red lights and stop signs, speed on crowded sidewalks, fail to signal when making turns or changing lanes, or even carry on phone conversations while biking (yikes!). Many pedestrians walk out into the street without looking both ways. Even more pedestrians walk into the street without checking to see if they have the walk signal. Just like motorists’ bad behavior, these things can be life-endangering. DC cyclists, know your laws! Allowed to pass motor vehicles on left or right, in the same lane or changing lanes, or pass off road. Use of bike lanes and paths is not mandatory, but motor vehicles may not obstruct bike lanes! Cyclists are required to have a bell or other device. Sirens are prohibited. After dark, cyclists are required to have a front white light and rear red reflector (or rear red light), may be attached to operator. Motorists do not automatically have the right of way. Neither do cyclists. This information–along with great tips for drivers, cyclists, and pedestrians–also comes in handy PDF form (download here). I’m going to put it up in my workplace and encourage you to do the same. 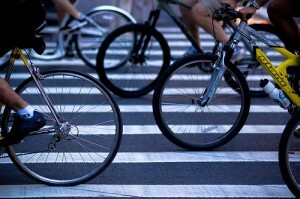 If you drive in DC, or anywhere, please be aware of pedestrians and cyclists! This means avoiding phone conversations, listening to loud music, or anything else that may distract you when you’re in your (relatively) safe metal bubble. Know your rights and responsibilities. Know your traffic laws. And remember, driving is a privilege, not a right. My heart is still pounding, but at least I’m not crying anymore. I salute your bravery, determination, and passion for biking the edge, and just hope you do not end up a statistic. I retired my street bike some 15 years ago after two close calls in a week, where non looking drivers cut in front of me and I took two spills across the hoods of their car. My riding philosophy was to be prepare as much as possible that every car did not see me and most would likely cut me off. Here’s to you having a shield of sanity around your ride. You MUST try rickshaw ride through the traffic (pedestrian, bus, car, worshipped cattle, roosters, no white dividing line, no traffic lights, NO lanes) in Old Delhi. What a thrill! Riding a bike on streets in any big city, especially at night, is just plain stupid when public transportation is available. As an observant and prudent automobile driver, I have learned to expect — and defend against — aggressive drivers wherever I go. But it’s the bicyclists and pedestrians I fear most. If I ever see a bicyclist obey a stop sign, I’ll get out of my car and applaud. Serena, I’m glad you got home safely. I’m a bike commuter myself, and although I rant about the dangerous drivers on Calgary’s streets, they sound absolutely timid compared to what you face in DC. I applaud you for not being frightened off of your own streets by sociopaths hiding behind their steering wheels. I can’t imagine anyone accepting, allowing, defending, or even encouraging such absolutely reckless and dangerous behaviour – except for the magic that dissolves all responsibility if you’re driving a multi-ton vehicle, bullying someone on a bicycle. You pay for the roads with your taxes. You are helping to alleviate heavy traffic by leaving a car in a driveway and riding a bike instead of driving. You are preventing increased pollution. You ride responsibly, safely, carefully, courteously, and legally. You have every right to ride on any street – except where otherwise explicitly restricted (freeways are off limits to non-motorized traffic in Calgary, because the speed differential is just too high to be anywhere near safe). Aaron, I’m sure you’re trying to be supportive, but that’s not how your comment came through. I agree that it would be nice if the sociopaths who make bicycle riding dangerous (through incompetence or sheer malevolence) would realize that they share the planet with other humans. But that’s not likely to happen. People become abstracted away from their surroundings the second they step behind the steering wheel, insulated by soundproof glass, protected by roll cages and airbags, and accelerated by 300 horsepower engines. They have little awareness of their surroundings, and little consideration for the needs of others. Their primary concern is shaving 5 seconds off their trip to the Starbucks drive-thru, to get their half-caff-whipped-soy-latte. Also, I (and many other cyclists) obey all traffic controls. I stop at all stop signs and red lights. I yell at other cyclists for passing through without stopping. But, from their perspective, it can actually be safer to NOT stop – stopping gives the cars behind them a chance to creep up. The “Idaho Stop” law is gaining acceptance, being adopted in many jurisdictions, and changes traffic laws so that bikes treat red lights and stop signs as yields rather than stops. This makes a LOT of sense, considering how much energy is dumped when a bike stops and has to start again (this is trivial for a car, since all the driver has to do is extend their right foot about an inch and they’re back up to speed – it takes work to get a bike back up to 30mph). OK. I’ll reign in the rant here. Bottom line, Serena, you have every right to ride your bike, at any time of day, on any street you like. You ride carefully, you make sure you’re visible (lights, reflectors, signals, etc…) and you follow the rules of the road. The best thing I can recommend is to take the lane if you need it. Use a pathway or marked bike lane if you can, but otherwise, ride in the lane rather than along the gutter. Taking the lane makes it clear that it’s not safe to pass you without changing lanes. It also shows the cars behind you that they need to pay attention to you. It’s not foolproof, but my close calls drop dramatically when I take the lane. almost forgot. the second recommendation is to ride as if you’re invisible. Because, to many drivers, you are. Whether they’re yacking on their cell phone, yelling at the kids in the back seat, fiddling with the radio, or just spaced out, there is a very real chance that they just don’t see you. Or that they don’t properly perceive your speed and direction. So, ride as if you assume all drivers can’t see you. You would think that in a city with such a large bike-riding population, people would be more aware of the traffic laws concerning motor vehicles and bikes (and people). It’s the same in Richmond, and each group takes a right-of-way power trip. The motorists think they have right-of-way over the cyclists, who think they have it over the pedestrians, who in turn think they have it over the motorists. Keep riding your bike though! I salute your bravery and perseverance, and your ability to hold back any acts of violence against stupid people! Good gawd, it’s 3am and I need sleep. I can’t even remember how/when/why I got on your website in the first place! How did I not see this post before? I applaud it. And you. I haven’t been biking in months, as I am a cold-weather wuss, but I biked pretty near everywhere I could during the summer. I occasionally did stupid things while learning how to bike in the city, but I always erred on the side of caution. I always stopped at stop lights, used hand signals (often with increasing desperation as cars failed to respond to them) and of course wore a damn helmet. I cannot believe how many cyclists I see who don’t do the same. I once had a fellow cyclist who complimented my use of hand signals. I assume because I bothered to use them at all. I’ve been lucky in that my close calls have only ever been close calls. I’ve had people yell at me for no reason. I’ve had people yell at me for taking up the lane when I had every right to do so and was surrounded by signs that affirmed my right to use the full lane. I’ve had people yell at me for not using the bike lane when it was, ahem, blocked by a line of cars who couldn’t bear to wait single-file in their lane (ah, Boston drivers). I’ve had pedestrians spring across the road without even a glance to see if there was traffic approaching. A second’s delay on the brakes and that would have been an accident. My worst incident was when a woman opened her car door into me as I pedaled to the T station on my way to class. I swerved the front wheel just in time to not shatter the window or send myself flying, but I cut up my fingers and nearly gave us both a heart attack. The frame of my bike was an inch away from the open door, with my wheel to one side. I nearly had panic attacks the next few times I had to go down that road.